The 109-year-old C.A. Thayer has long been an attraction at the San Francisco Hyde Street Pier as part of the historical ship collection. This 400-ton black wooden schooner is now out of the water having what historians say is the largest and most extensive rehabilitation of a merchant vessel in United States history! In 1895, Danish-born Hans D. Bendixsen built the C.A. Thayer in his Northern California shipyard (located across the narrows of Humboldt Bay from the city of Eureka). She was named for Clarence A. Thayer, a partner in the San Francisco-based E.K. Wood Lumber Company. The Thayer was a classic turn of the century three-masted lumber schooner and she played a large part in the reconstruction of San Francisco after the 1906 earthquake and fire. She was designed to run between Washington and California with heavy cargos of Douglas fir. It is hard to imagine, but as late as the California Gold Rush in 1849, East coast vessels still hauled New England lumber 13,000 miles around Cape Horn to San Francisco. That soon changed as lumber mills opened in California, Oregon and Washington. The Thayer's lumber career ended in 1912 after being seriously damaged in a heavy southeasterly gale. Notwithstanding, the Thayer has had a remarkable career, progressing from lumber hauling to the fishing trade to serving the U.S. as a floating storehouse in World War II. Today, the Thayer has become a beloved historical treasure. She serves as a stage for sea based plays and as a hands-on educational experience for people interested in life aboard a sailing ship. The Tattoo Archive has done historical slides show on board the Thayer and I have personally had the pleasure of sleeping on board. In 1993 the National Trust for Historical Preservation named the C.A. Thayer as one of the nation's most endangered historical places. This dubious distinction led to the current two year, $9.6 million restoration. The C.A. Thayer is from an era when "ships were made of wood and the men were made of iron." 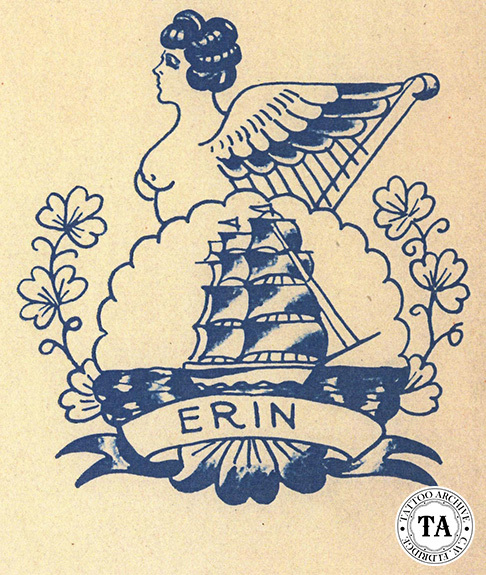 Sailors were proud of their chosen occupation and often wore that pride on their skin, choosing tattoos that showed their line of work. In 1798, five hundred applicants for Seaman's Protection Certificates described their tattoos and 22 percent of them wore tattoos that identified their profession as seafarers. 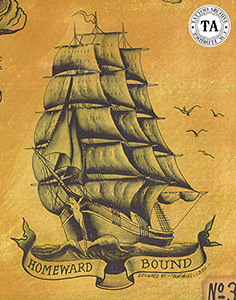 These tattoo designs included ships, anchors, and North stars, etc, and made up the largest percentage of tattoos, other than names, dates and letters. In the old navy, when sailors were know as "Jack Tars" they sported a full rigged sailing ship tattoo when they had sailed around Cape Horn.